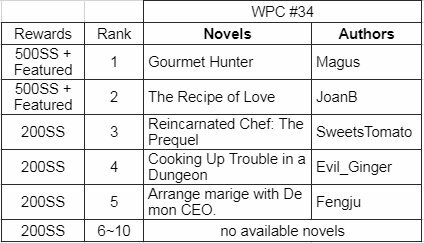 Hi All~The results of our Writing Prompts Contests #34 are out! There's countless wonderful dishes from Earth, and each place has their own unique ingredients and cooking methods. As a great chef from Earth, the transmigrator chef's greatest task is obviously to introduce Earth's delicacies and dishes to another world, improving their eating standards. If you are interested in the culinary arts, why don't you try writing a female lead novel about food? There are many ways to go about writing this topic. You can create a main lead who wants to be a culinary god and let your imagination go wild. In your story world, there can be a restaurant unique to you. Or you can be bolder and let your lead cook dishes with special effects. For example, a cake that gives you good luck after eating it. You can also make the chef a non-professional expert who only does it for a hobby. For example, create a celebrity or supermodel who is really good at cooking. Every time a perfect dish is made, all she can do is look at it due to her dietary restrictions her job entails. As a result of her food, the people around her—manager, assistant, makeup stylist—all become fatties. Everyone complains about it, but their bodies do not match their words as they yearn for her next culinary attempt. When you create your new novel, you can choose any genre that you wish. Then, the writing contest options will appear. Choose the [Writing Prompts Contest #34：Chef] option in order to participate in this contest. 1.The main topic of your novel should be Chef. Otherwise, it shall be treated as an invalid entry. 2.Your story entered in the contest must be your own original work, with the copyright held by you. No plagiarism is allowed. 3.The contest will take place from November 26, 2018 to December 2, 2018 (GMT +8). 4.The story must not contain any racial or religious discrimination against any other cultures or their lifestyles. 5.Only newly-created original novels shall be allowed to enter the contest. 6.Webnovel reserves the right of final interpretation for all stories submitted in this contest. The 1st ranked original novels will be recommended on the front page. (3) Particularly excellent novels will receive the opportunity to obtain a paid contract. Read my new book Slave For Dual Cultivation! It gets down and dirty in the bed room and the kitchen! Lily Scarlet’s life was hard and cruel. She worked daily to get farther and expand her cooking career, but she was never given a chance by her boss, who wanted to use her talents. One day, when she threatened to quit and tell everyone that she was the true cook, her boss killed her in a fit of rage. However, this isn’t the end for her. Waking up in the body of a chained girl she is given a second chance at life. Will her dream of becoming a top chef finally be accomplished or is she destined to quietly fade away? WEBNOVEL_OFFICIAL can I ask if I can change the writing prompt of my published story? is it possible? If you like Systems, time-travel, the xianxia world, a male MC of True Virtue (TM) and shameless girls to contrast, try my novel for sure! There is some R-18 content but it is carefully marked in title, so you can skip if you aren't inclined! Synopsis Gourmet Hunter: There are dangerous and terrifying beats with flesh so ripe it melts on the tongue, trees containing fruits of legend and ponds gushing with rich liquids, Valleys with bountiful harvests and Mountains housing edible jewels. To venture out, conquer, savor, and evolve from these ecotic flavors is what it means to be a gourmet hunter! Winner of entry #32 male-lead contest, though I don't know when this novel would be featured? since I don't see it in the main page, I can see apocalypse fortress but not mine, so yeah it should be an error or something. Only for an adult if you want to read it fully, but the teenager could read it if you skip H-Scenes chapter. This one is my entry for #33 male-lead contest, the one before this but this one wasn't a priority, because I am re-reading the GDW original while writing. The Witches’ Magic Food Doesn’t Work on Me! One day the High school Princess Rose brought in some heart shaped brownies for the whole class. I also ate a brownie. I thought that it tasted pretty good, but that’s it. For some reason my entire class fell in love with her. They are even willing to die for her. I think she’s a witch! She has to be! This story is about the main character Nick avoiding the witch Rose and her antics. This is all to preserve his youth that has yet to bloom. do i also join? i can't even update the queen of performing arts regularly. haha. there are six more plots from the series anyway, i'll just hope they don't pop up too soon. The culinary competition will start tomorrow and Asha was still in the mangrove forest of Paniban trying to find the last ingredient that her father wrote in his special recipe. A year earlier, the magistrate awarded her father as the best chef in their little village of Mangpur because of this same recipe. This award paved the way for him to start his own restaurant. However, a hidden enemy, jealous of his success, poisoned the magistrate with the same dish and led to his death through hanging. Asha became an orphaned then. Asha made a pledge that she will make this dish alive again and prove to everyone that her father’s dish was not the cause of the magistrate’s death, but how can she prove this? Let’s walk with Asha as she discovered her gifting in cooking, her life as an orphan, and in the midst of the culinary world where men prevailed in the culinary city of Paak. To spice things up, a celebrity chef wanted to immerse himself in what you call village cooking life for him to discover new culinary styles. He blended among the villagers but only to discover Asha’s special recipe to make people happy and to find love along the way. JoanB so Asha is male or female? Just making sure, we don't have to post the link here to join, right? Just publish the novel while selecting the Contest option, right? Morvian hmm I think a woman..
Morvian Female. I changed the synopsis for it was not clear at first. Thanks for pointing that out.